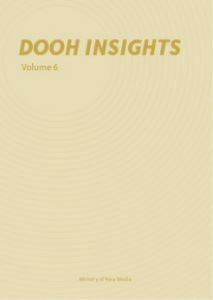 We are really close now to sending DOOH INSIGHTS Volume 6 to the printers. We should receive 10,000 copies back in September and as usual we will first be hand-delivering copies in London, to all of the media owners, media buyers and spcecialists. The first events to receive copies will be the JCDecaux / IAB upfront on October 4, closely followed by Ocean Outdoor’s 8th Annual Digital Creative Competition awards ceremony at London’s IMAX (October 5, 2017) and then Clear Channel UK’s own upfront (October 11, 2017). New York Digital Signage Week sees several thousand more copies distributed – every attendee at The DailyDOOH Investor Conference and every attendee at the DPAA’s Video Everywhere Summit will walk away with their own copy. We’d like to thank all of our advertisers, without whom, doing quality publications such as this would not be possible. In alphabetical order; Amscreen, Ayuda Media Systems, Captivate, Clear Channel UK, Civiq Smartscapes, DPAA, DSE, DSF, Elonex Outdoor, Esprit Digital, GDS, Peerless AV, Primesight, Sansi North America (SNA), Scala, Screenfeed, Show & Tell, Ultravision and Verifone Media. This entry was posted on Friday, August 4th, 2017 at 12:13 @551 and is filed under Scuttlebut. You can follow any responses to this entry through the RSS 2.0 feed. You can leave a response, or trackback from your own site.